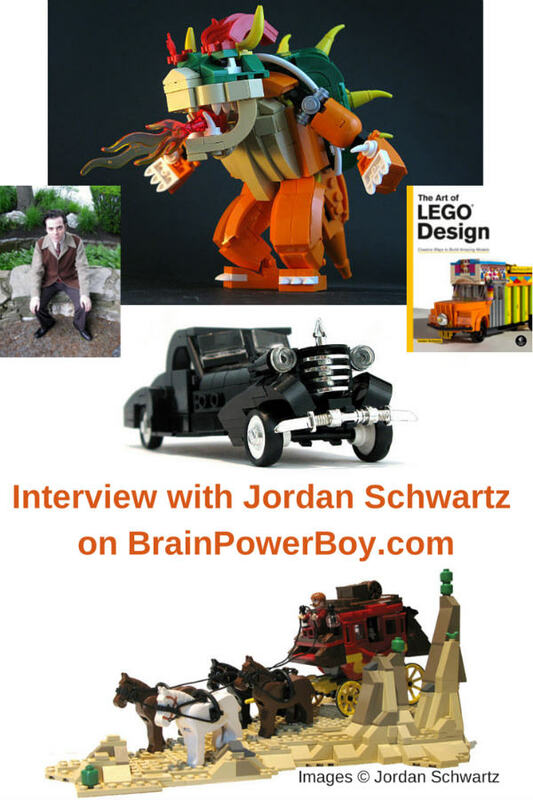 Interview with Jordan Schwartz author of one of my favorite LEGO books ever. The very first time I saw Jordan Schwartz’s work I knew I had to try to get an interview with him. I reviewed a copy of his awesome (and I really mean that) book The Art of LEGO Design and knew I had to track him down to see if he would agree to answer a few questions. Jordan is a young builder and that is one of the reasons I wanted boys to see his work and hear what he had to say. Jordan’s LEGO builds have been featured in exhibits all over the country and he has won countless awards. He has also been in a couple of other good LEGO books, Beautiful LEGO and A Million Little Bricks. He was lucky to have supportive people in his life, like his grandparents, who supplied a young building enthusiast with plenty of bricks. Aren’t boys who love LEGO always looking for more pieces? I know my son is. Literally my fondest memories of growing up revolve around LEGO®. They are the most vivid – the feel of opening the cardboard box, the sound of the bags of elements rattling to the ground, even the smell of the fresh plastic stick out in my mind. Before we get started, let me share the link to The Art of LEGO Design book review that I did. Jordan has something special. He is a LEGO builder with heart. 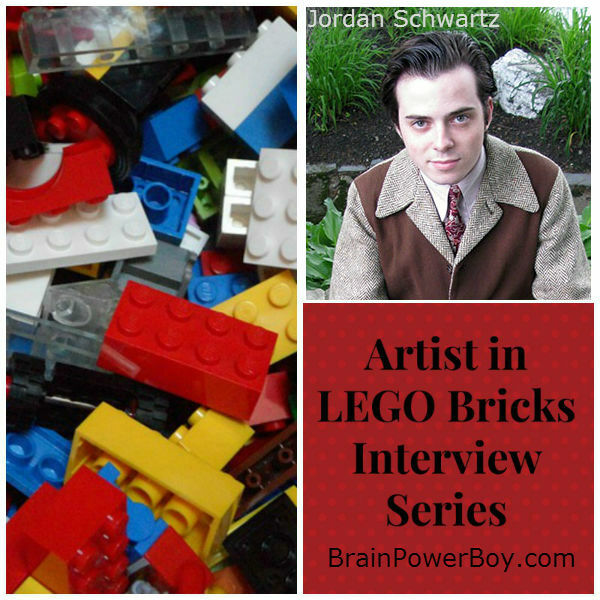 I asked Jordan to answer a few questions about LEGO and Learning and he agreed. On to the interview . . .
Jordan: I must confess – then again, perhaps confess is not the right word, because it suggests surprise – that I almost exclusively played with LEGO sets as a child. And as a teenager. And as an adult! I recall at one point later in my childhood that I gravitated to other toys, just for fun, but these toys were LEGO-esque anyway. But LEGO sets were the only thing that satisfied me because there was such a diversity in the products’ play experience and they were of such a fine quality. I’d build the sets with the instructions. That was great! Then I’d have my own buckets of loose pieces and I’d build something else from them. And that was great too! They provided endless hours of fun. You know, a lot of toys make similar claims (video games, especially). And while I like the odd video game too (as a child and even now), they never made me as happy as a raw pile of LEGO bricks did. Jordan:Well, the novelty of LEGO that boys who really enjoy building will discover as they grow up is that the complexity of the models is entirely in their control. LEGO makes plenty of large, complicated sets marked for ages 16+, so they can keep buying and building those. And the models they make on their own can be equally complex or, if they’re really serious, even more complex. When I worked for The LEGO Group as a designer, I (and my colleagues who also hailed from the online LEGO community) would have to dial back the intricacy of our models because they were, shall we say, too intense. It took me a while to learn how to do that! Jordan: I’ve got to tell you, I think I’ve learned more from LEGO (and especially from working for the company) than I’ve learned anywhere else. LEGO helps naturally develop children’s motor skills. It sharpens their minds. It teaches them about math because of all the counting that’s necessarily involved in building sets. And I learned all this as I grew up, constantly playing with the product. And I did very well growing up in school, too, so I’m sure LEGO had something to do with it! Jordan: The trick is to keep on building! It’s cliche, but if you really want to build great models, or if you someday want to help design LEGO sets for other kids by working for the company, you need to keep on building! Just like with anything, practice makes perfect. So stay with it. Develop a style. And most importantly, have fun with it. A special thanks goes out to Jordan Schwartz for providing his thoughts on LEGO and boys’ learning, and for sharing his work with us. It was really a pleasure to hear from him. Jordan’s website is very slick 🙂 Take a moment to share it with your boy. He has images of his own LEGO creations and much more. I am very fond of the Chitty Chitty Bang Bang build. You can also find Jordan on Flickr. You may also be interested in our other Artist in LEGO Bricks interviews. We have interviewed some great builders.